All public trips which start at 2.30 pm last for approximately 2½ hrs except for the October trips which last for roughly 1½ hours. The public trips which start at 11.30 last for approximately 1½ hours. The 2½ hr trips go through Dun Mill and Wire Locks returning to to Hungerford at approximately 5pm. The 1½ hour trips go through Dun Mill Lock and return to Hungerford approximately 1½ hours later. With the longer trips it maybe possible to disembark briefly at Wire Lock, depending on the conditions, in order to stretch ones legs and enjoy the views of the magnificent Berkshire countryside. 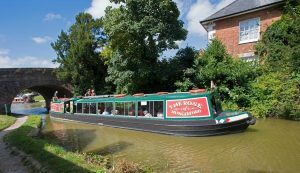 The Rose of Hungerford is a purpose built 16.76 metres (55 feet) long wide-beamed passenger trip boat owned by the Kennet and Avon Canal Trust and has a maximum capacity of 50 passengers. 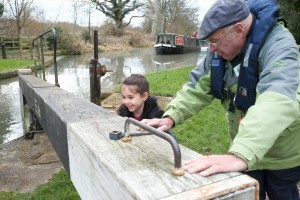 It is operated by volunteers of the Kennet and Avon Canal Trust. The Rose has sliding picture windows for warm days, but is fully enclosed with central heating if necessary. Whilst we normally allow well behaved dogs on the Rose, it is up to the Skipper on the day to ensure there are no objections from other passengers. Hot and cold drinks and a fully licensed bar are available on trips. The Rose also has a wheelchair lift and a toilet large enough to accommodate wheelchairs. The table shows you all the Rose of Hungerford trips available to the public in the next 30 days. You can view trips for a particular month by selecting the month. Please select the trip description to get details of the trip and the passenger fare.